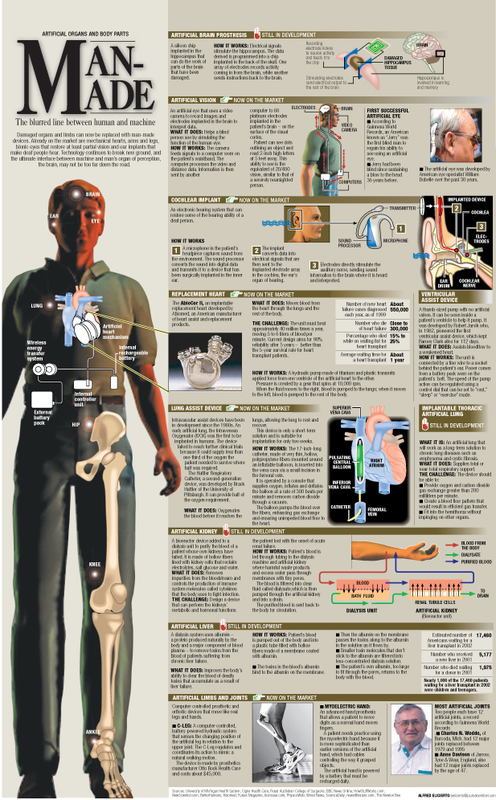 Damaged organs and limbs can now be replaced with man-made devices. Already on the market are mechanical hearts, arms and legs, bionic eyes that restore at least partial vision and ear implants that make deaf people hear. Technology continues to break new ground, and the ultimate interface between machine and man’s organ of perception — the brain — may not be too far down the road. Still in development (as of the time this graphic was published in 2005) is an artificial kidney that can perform the kidney’s metabolic and hormonal functions that the patient lost with the onset of acute renal failure, an artificial liver that will clear the blood of deadly toxins and implantable thoracic artificial lung that will work as long-term solution to such chronic lung diseases as emphysema and cystic fibrosis. Story and graphic by Alfred Elicierto, published in the MIlwaukee Journal Sentinel on June 6, 2005.
writing is truly nice, every one can simply know it, Thanks a lot. Could be the BEST topic that I read all week!